IS AN ORGANIZATION SPHERICAL OR PYRAMIDIAL? THAT’S THE ESSENCE OF THE QUESTION. Only how should we understand our organizations in this limitless universe? What are they? Are they circular planets flying in an accurate orbit within their own space while being impacted by laws of gravitational forces, attraction and inertia? Are they artificial bodies of pyramids borrowed from Star Wars wandering freely within the space of the cosmos while conflicting not only with outside forces but also with their own team members residing within? 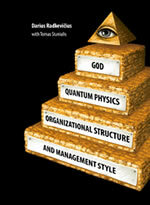 This book will show how to transfer your organization culture from Pyramidic oriented to Flow oriented management. It will help You to implement Flow management methodologies like LEAN, TOC or Six Sigma much faster; to create an organization that is outstanding for its internal as well as its external harmony. By operating on the foundation of self-organization, the organization will be improving daily, pursuing long-range goals and caring not just for its employees but its entire environment as well.